The American Kenpo Jiu Jitsu Academy opened in 1990 and for over two decades, We have been serving the community helping hundreds of children, teenagers and adults to develop confidence, respect, focus, concentration, physical fitness and other unique benefits of a martial arts education. Is to enrich the lives of our students & their families with prime martial arts education and valuable life skills. We share a community where healthy, supportive & value oriented families can come together and help each other to successfully reach their goals. We envision a future where every student achieves their highest goals, live happy balanced lives and work hard to become the new leaders of our community, country and world. Our members can learn with us Self Mastery Skills and the most effective combination of stand-up and ground Self Defense techniques, weapons training and physical fitness. Through our practical approach to self-defense, our students quickly become capable of defending themselves in virtually any situation. Mr. Tabatabai began his martial arts journey in 1978 at Sr. Grand Master Ed Parker’s West Los Angeles American Kenpo School. He was personally promoted to the rank of Master (5th Degree Black Belt) by American Kenpo’s creator, Sr. Grand Master Ed Parker. 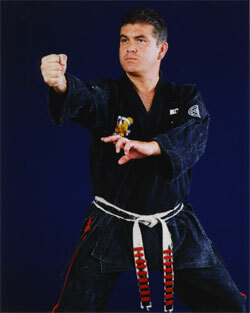 He currently holds the rank of 9th Degree Black Belt (Grand Master/Senior Master of the Art) in American Kenpo. Masters Ryron and Rener Gracie. He continues to train daily under Master Jean Jacques Machado. 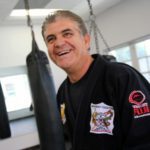 His expertise goes beyond his physical skills: Serving the international martial arts community, sharing his innovative vision and helping hundreds of practitioners and school owners around the world to become better role models, students of the art and leaders of their own community. Through his decades of intense study and dedication to American Kenpo, Senior Master Tabatabai became increasingly aware of a gap in the system: None of the techniques included defense if you were taken to the ground. Give me a call at: (818) 992-6610 Or click the program (above) that you’re most interested in!